Backpacks are a tell-tale sign that back-to-school is here. But like teddy bears and bedtime books, backpacks are not ordinary objects. A backpack gives your child magical power – the power to walk into a new classroom knowing he belongs. Like little turtles carrying their houses wherever they go, children carry a corner of home and a place of their own in those not-so-little backpacks. This extraordinary backpack helps your child to manage a tricky emotional transition and the intellectual uncertainty of being in a new situation. Kids don’t love their backpacks because they got caught up in a consumer fad. Backpacks serve a meaningful purpose in your child’s school experience. 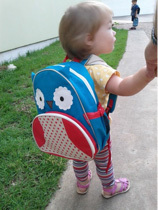 The backpack gives your child an immediate connection to home – mommy bought this backpack for me to go to school. It gives your child emotionally valuable property in this new world of other children and teachers – your child “owns” a piece of this new world (and may need to hold her backpack until she feels confident and secure). A child’s backpack is an extension of herself – her pride and personality. The backpack routine from home to cubby and back home creates the ultimate sequence to a sometimes chaotic schedule. Home and school are seamlessly connected by this traveling backpack. Pack it with love for the first day and your child will thrive in this wonderful new place. With backpack in hand, you can help prepare your child in other ways for his new school adventure. Two weeks is plenty of time for toddlers and preschoolers to try to comprehend what lies ahead of them. Anything longer loses relevance to your child’s daily situation. Use the backpack at home to “play” school. Many parents send a picture from home in their children’s backpack the first week of school. You can also take a picture of your child’s school, possibly your child’s classroom and teacher to keep in her backpack the weeks before school. If the actual classroom isn’t available, a “pretend” classroom with pictures from Google Images will also work. Make a pretend school at home and talk about all the fun things your child will do in school. Use these pictures of different school activities and learning centers to help your child adjust after school begins. Re-use them in a sequence game or a story-telling board. They will prompt your child’s memory of things that happened at school: Where did he play? Who played with him? What did the teacher do today? These pictures become another way to remember and reconstruct a very busy day. You can also add a few back-to-school children’s books* to the backpack. As you child reads these stories, he learns about the school day and starts to imagine what school means for him. Fears and questions can be re-examined in different ways with each new reading. Finally, start the calendar count down the week before school. Preschool age children can mark the days with stickers on a calendar or mark the days on a white board. For toddlers, parents can make a play dough cake with 7 popsicle sticks “candles” – taking away one stick each day as the first day of school gets closer. When first day of school will arrives, be patient as your child puts his little arms through the straps of that great big backpack. It holds all his excitement about the new, unknown adventure. He is ready. His friends and teachers are waiting for him! If this isn’t the most gorgeous ode to the backpack I’ve ever seen. Okay, it’s the only one I’ve ever seen, Karen, because your insight is so unique and on point. I predict that even if there were a hundred odes to backpacks, your’s would still be my favorite. thank you so very much!!! I know you know the “magic”!